I’ve been running a regular Dungeon Crawl Classics RPG game for the past several months. But a different group where I’m a player recently asked if I would occasionally be a “judge” for that game, too. I was flattered and said yes. 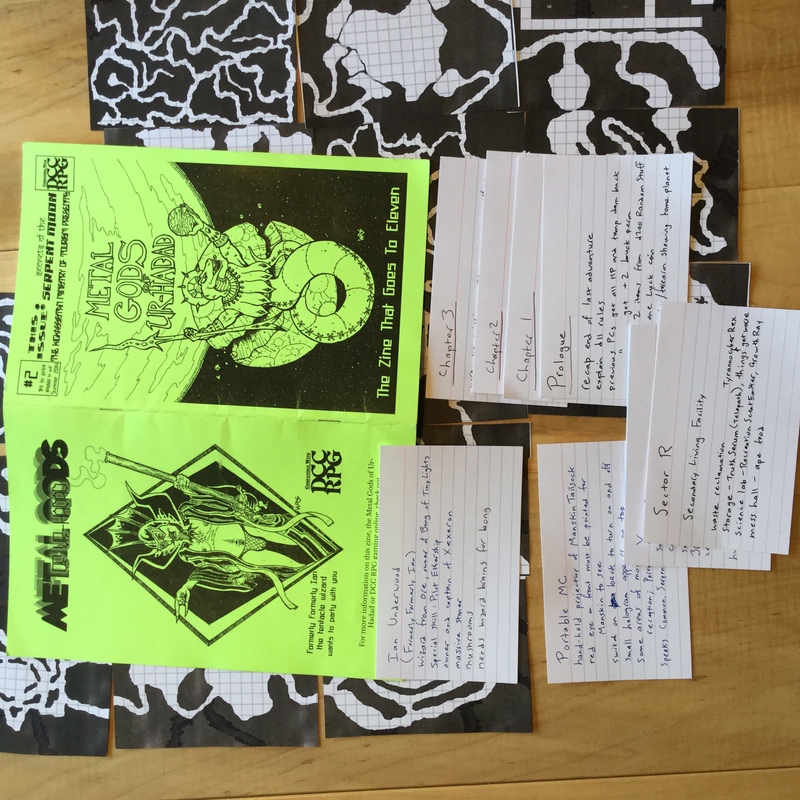 DCC has a strong zine community, and one of those zines is called “Metal Gods of Ur-Hadad“. There have only been three issues so far. I’m waiting for the third in the mail, but the first two are hilarious and inspirational. The zine, from what I understand, is mostly just stuff from this one particular campaign that these guys somewhere in the midwest (???) play. In issue #2, there was an article called “Secrets of the Serpent Moon.” It’s not a fully-fleshed adventure, but is more of an “adventure kit” — a template and some various ideas that you can put together to build your own adventure. Well, one group of PCs in the gaming group I was asked to help judge had just finished play testing a funnel that one of the other two judges had written. And that funnel adventure had a heavy serpent-man theme. So what better thing to chain onto the end than an adventure about serpent-men on the moon? I got to work writing my own adventure based on the adventure kit from the magazine. One feeling I’ve been getting from the other DCC game I run is that when I create custom-made adventures, I spend too much time writing down every little detail into a nice word processing document. I think I’ve been trying too hard to imitate the really good 3rd party adventures on the market for DCC RPG. But more detail isn’t really making the game better. So I decided to swing the other way. I wanted to run a game that was 100% true old-school, with no electronic technology whatsoever. No smart phone, no iPad (despite the fact I love Purple Sorcerer’s Crawler’s Companion app), no laptop, no pretty module created on a desktop publishing system. I wanted to write an adventure that would all be presented from a stack of 3×5 note cards, printed (or hand-drawn) maps, the zine, and regular old dice. “Party like it’s 1974” is one of the slogans of Dungeon Crawl Classics. The rest of this blog post is about how I did it. Other people will take the “Secrets of the Serpent Moon” template and go a totally different direction, of course. The article from the zine talks about how to put together a basic plot for what the PCs need to accomplish on the moon. They start as recently-thawed-out mammals that the reptile-men captured some time in the past (57 years ago, in my case, I decided — some of you sci-fi fans will know the significance of “57 years“). There’s a problem at the serpent-men’s moonbase, you see, and only the PCs can solve it. I broke my story up into four sections, a Prologue and three Chapters. The Prologue section was just meant to update the characters in a couple ways. You see, the serpent-men have been experimenting on the party, and they’ve all had modifications that take them far from the norm. For instance, some have extra limbs, or a parasitic twin, or a new locomotive system instead of legs. Then with the Prologue out of the way, there are three Chapters. I’m thinking each chapter will be roughly one game session. But as I write this, we’ve only finished Chapter 1. The key points of each chapter went onto a 3×5 card. generate the different areas of the serpent-man base. I decided it needed to be bigger and more structured, so I broke the base up into different “sectors”. Some of the sectors have the randomly-generated rooms from the zine, and others have other stuff. Rather than making some kind of detailed map, I just took one 3×5 card and drew a very basic flow chart on it, to show which sectors connect to which other sectors. The PCs would start in Sector F, where they were thawed from the cryotubes (“F” stands for “frozen”), and continue through the base to Sector X. Sector X is where the threat/challenge/danger is (“X” for “unknown, of course, and it sounds cool). 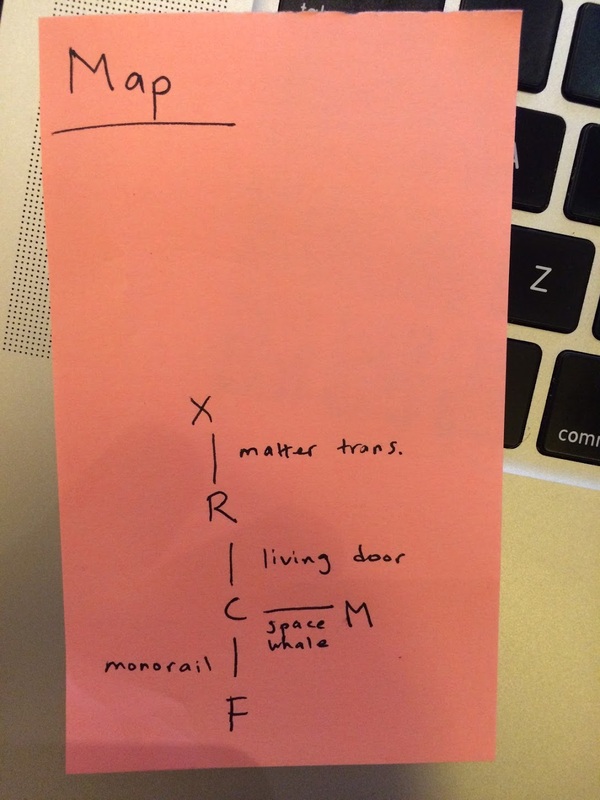 The zine article has a table to randomly generate how each sector is connected to the next, so I rolled and wrote those in on my 3×5 map: “matter trans.” and “living door” and “monorail” and “space whale”. In my case, I decided that Sector X is where a base expansion project was undertaken, but the serpent-men doing the excavation ran into some unknown creatures that killed them all. Let’s call those creatures “Selenites” for the sake of argument (and because they’re actually the same Selenites as in the H.G. Wells story). So Sector X leads to the Selenite caverns, which is a sprawling complex of caves containing moon calves, Selenites, a stoner wizard stranded on the moon, and a few other things. 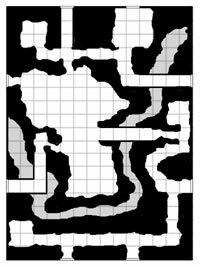 So for the caverns, I printed out the pages from the PDF of “Dungeon Crawl Classics #9: Dungeon Geomorphs” that a bought a few months back. Then I chose the geomorphs that looked most like what I wanted, cut them up, and arranged them how I liked. I used a black Sharpie to color over the caves that I didn’t want, since the caverns would continue literally forever otherwise. And that’s pretty much it. That’s how I turned the “adventure kit” for “Secrets of the Serpent Moon” into a runnable adventure with all low tech pen-and-paper components.